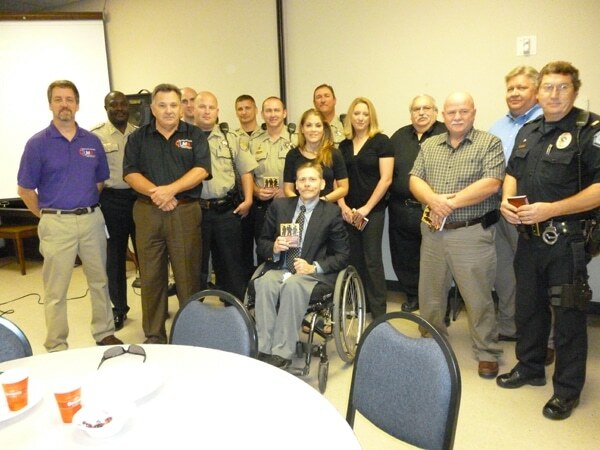 UMM of First United Methodist Church Pineville LA recognized and showed support to the first responders of the community, by presenting 75 Strength for Service to God and Country Devotionals to the Pineville Police department officers and the Officers of the Rapides Parish Sheriff’s Department Pineville substation. Members raised $1100.00 with a BBQ fundraiser to fund the purchase of Strength for Service Devotionals as well as donating $200.00 to Grace Camp $300.00 to The Pineville Youth Center, and $200.00 to The Society of St. Andrew. Pictured are Fred Carter UMM President, Randy Hoben UMM Vice President, officers from the Pineville Police Department and Rapides Parish Sheriff’s department.